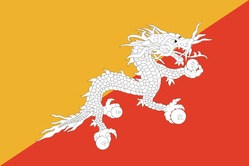 Featuring Druk, the striking thunder dragon of Bhutanese mythology, the Bhutan flag's dimensions were once modified so that it would flutter better. This colorful flag is 3' by 5' and printed on lightweight polyester, perfect for indoor display. The flags also have bronze colored grommets for easy hanging.